You can try. Just use low amp and monitor battery when charging. After charge, check if the battery is not self discharging and if it is not hot when charging. You have big chance to revive it, but for sure battery lost already some capacity. thank you, i should have unplugged that gps module... it was draining all winter long, ive read that depleted cells might not be able to deliver the same amps as before, even if you get them back up to the right voltage. and if i where to try, it could end up in smoke. if i feel for any heat and unplug right away, it should be "safe" ? there is a total of 20 cells per pack? its total of 1600wh, but 800wh per side. Voltage should just depend on the number of serial cells (20). All 3 blocks of 20 cells in each pack should automatically be at the same voltage (also same voltage between the packs as they were connected). I'm by far not expert enough to answer your questions, but... 1.45V doesn't sound too good when usually critical numbers are like... 2.5V maybe? I'm not sure how safe you'd be even if the cells can be reactivated. But again, in the end I just don't know Hence @US69. With the cells beeing in average at 1.45V (some below, some above) you should not charge the pack unattented! And best somewhere outside. I think you've killed those packs. When I experimented with reviving used lap top cells, some were low like yours, and I needed to trick the charger to get them to charge, but I wasn't even finished patting myself on the back before I was confronted with the "no capacity" issue. While I could get these cells up to 4 or 4.2V a load test revealed that they had little capacity. One even got so hot (in a pack of about 20 charging) that it was too hot to touch. I was perhaps, minutes away from thermal runaway and explosions and fire---IN MY BEDROOM. You may get lucky, but be vary vigilant in charging as mentioned (better to charge outside than to experience thermal runaway inside because you won't have anything to do until a fire breaks out and then it's very dangerous to get close to the wheel to move it outside) and IF it comes out the other side, in one un-burnt piece; then I would ride cautiously while observing voltage sag and range. I'm not sure you will ever feel safe on these packs again. Thermal run away is impossible to detect in a cell on the inside of the pack shielded from inspection by the wheel and the batteries around it. If possible, remove the packs and charge them away from the wheel; that way if something does go bang it wont damage the rest of the wheel too. If you charge it at 0.5 AMP it won`t burn or don`t heat to much. Even if cells will be damaged. So you are safe, but better anyway charge it outside. Voltage should go up preety fast at the beginning of charging and then stabilize. I done that in the past with single 18650 cells. Good to hear that. Keep us posted. When a battery pack fails, it seems there is almost always a dead pair of cells or two involved while other cells are still good. That said, your pack got to the super low voltage by a single constant discharge, so dead cells might be the issue. I would still measure each pair first to know what exactly you are dealing with. To do so he have to destroy the cover of his battery. At this point there is no need for that. Easier and faster is to do full charge and discharge the battery. Masure capacity charged and discharged and compare it to nominal battery Wh. Normally yes, but charging a dead li-ion cell is strongly warned against. I don’t know if it can be done safely, which is why I wouldn’t take the risk. 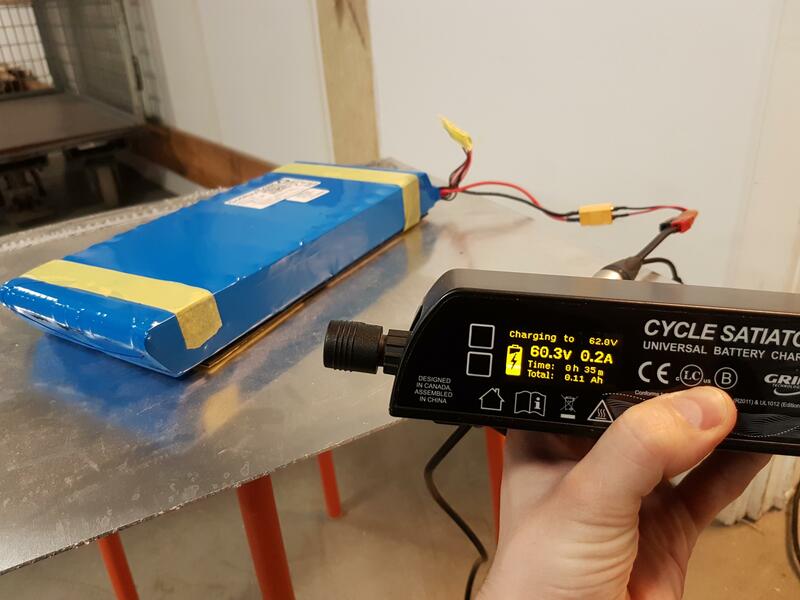 The voltage shown by the charger will be higher than the actual pack voltage during charging because of internal resistance in the BMS/cells/wiring/connectors. To "force" current to flow through the battery, the external charger voltage must be higher than the pack voltage. The resulting current from the voltage difference is then limited by the resistance (plus the charger limits it to some maximum through its own constant current source- or sink -circuit, basically dropping the output voltage from the charger). I've charged single cells dismantled from old laptop battery packs and power tools, usually the ones which have dropped to low voltages (2...2.5V) can be somewhat revived by charging them slowly (like at 0.1A/100mA or so), but they don't hold much charge, have increased internal resistance (the voltage sags a lot during discharge) and are usually pretty much useless. Below 2V I've put them directly into the recycling bin (tape the ends so that they can't short circuit through other batteries/cells in the bin). 29V / 1.45V average per cell is very low, unfortunately likely many or most of the cells are beyond salvaging. If internal damage has already occurred (metal depositing/dendrite build-up), the cell might have internal short circuit (which can still have high enough resistance that the entire cell hasn't totally discharged), in which case charging or discharging it with higher current can lead to thermal runaway and explosion/fire, and the cell will self-discharge much faster than usual. Can't really say what is "usual"/normal self-discharge speed, but my KS16's have hardly lost any charge being stored away for winter, they haven't been charged in over 6 months, so... "very, very slow" . They're still powering the BMSs all the time, but the quiescent current for most BMSs is likely somewhere in the tens of µA's (microamperes). Never had a battery fire occur, but better be careful, based on what I've read and seen on videos, it's a nightmare.